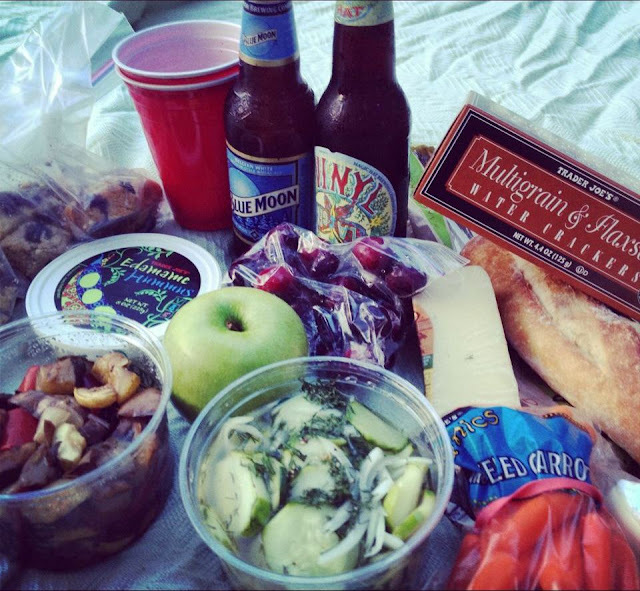 Outdoor picnics in the summer are one of my favorite activities. Nice weather, good friends, an excuse to lazily drink bottles of chilled wine paired with cheese and baguette...what's not to love? However, in recognition that many hours of wine, rich cheese and thick bread can induce quite the calorie-laden food comma, I introduce to you Grilled Summer Vegetables and Danish Cucumber Salad to add some easy, reliable, light and healthy accompaniments for a wholesome picnic spread. Proven to be tried and true favorites, I know these two recipes by heart. Grilled Summer Vegetables star all the hot seasonal produce right now; their natural goodness subtly sweetened with a balsamic-honey glaze. I discovered their best use last month: sandwiched in between baguette and cheese. Tear off a piece of baguette, top with grilled veggies, and finish with a thick creamy slice of brie cheese. The soft, buttery cheese will meld with the crunchy balsamic vegetables, and the vinaigrette will seep into the bread. Yum! Danish Cucumber Salad is a truly refreshing salad that's a must for hot summer days. Cucumber rounds and fresh dill are tossed in a sweet cidery vinaigrette to give an almost pickled taste, and thinly sliced onions contribute a nice bite. A dash of cayenne pepper creates a hint of spice in the cool, light dish. 2. Line a large pan with tin foil, and spray with olive oil mister or cooking spray. Add chopped vegetables to pan. 3. Whisk together vinaigrette in a small bowl. Pour evenly over vegetables in pan, and toss to coat. 4. Bake for 45 minutes, turning once in the middle, until vinaigrette thickens and caramelizes vegetables. 1. Sprinkle salt over cucumbers and let drain out in colander. Transfer to large a bowl. 2. In a small saucepan, heat water and sugar together over medium heat, stirring frequently until sugar dissolves. Remove from heat. Add cider vinegar, salt, pepper, & cayenne to saucepan. 3. Add contents of the small saucepan to cucumbers and onion. Stir and let marinade in the refrigerator for one hour before serving.